Wanna take all your PowerPoint presentations on your iPhone and view them wherever and whenever? 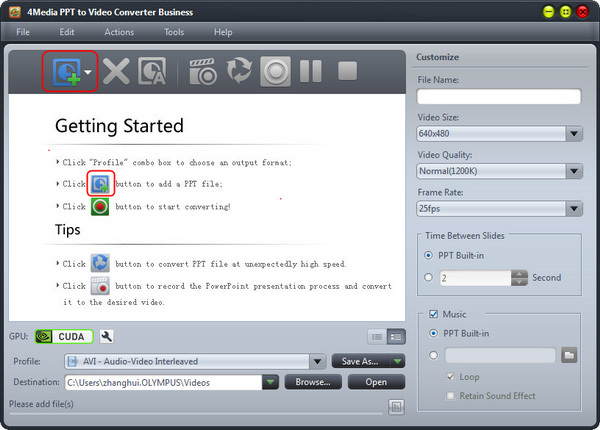 4Media PPT to Video Converter is the right solution to decode PPTs for iPhone users. 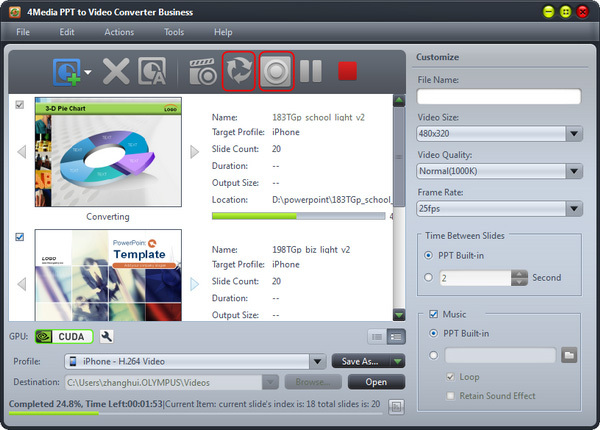 Using this powerful PowerPoint to Video Converter, you can convert all your PPTs to iPhone compatible H.264 format quickly and easily without the need for Microsoft PowerPoint. Not merely just a PPT to iPhone converter, 4Media PowerPoint to iPhone Converter can also help you make customized iPhone video presentations: rehearse and record your own commentary, add background music, set slide transition interval, and attach your own watermark; convert with all slide features reserved; or convert at maximum speed with all slide features removed. Go to comparison page to check the comparison. And what need to mention is that the Free version does not support PPT to iPhone converting, you can choose the Personal or Business to try for free. 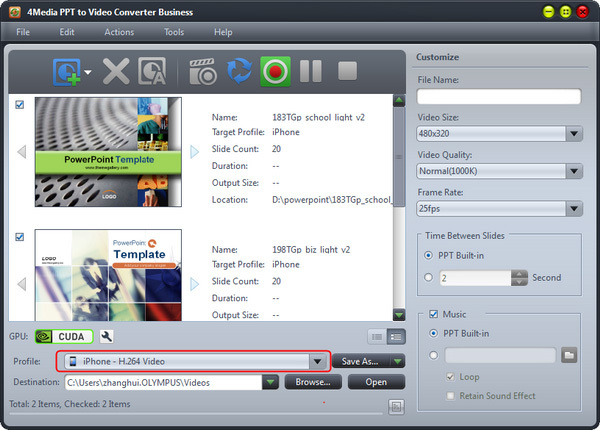 How to convert PPT to iPhone videos using 4Media PPT to Video Converter? 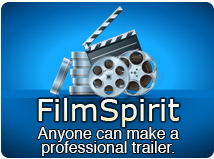 Check the PPT file(s) you want to convert, and select output profile: in the "profile" drop-down list, choose the "iPhone" category, and set the format as "iPhone - H.264 Video". And you can click "Browse" to set the target file destination yourself. Click "Convert" button to start the PPT to iPhone conversion. Tip: If you want to convert the PPT without any effects( the sound, animation, etc. effects), you can click "Rapid Convert" button as picture above shows. Only for a while, the conversion would be finished. Click "browse" button to directly open the converted iPhone MP4 file directory. Put the files on your iPhone, and watch PPT on iPhone from now on. In addition, in the business and personal versions, you can add Narration and watermark to the target files. You can check the detailed user guide for further information.